Welcome! Our warm and dynamic team is here to welcome you and is on hand day and night. Friendliness is the name of the game to ensure you have a wonderful and unique stay. We look forward to meeting you soon! 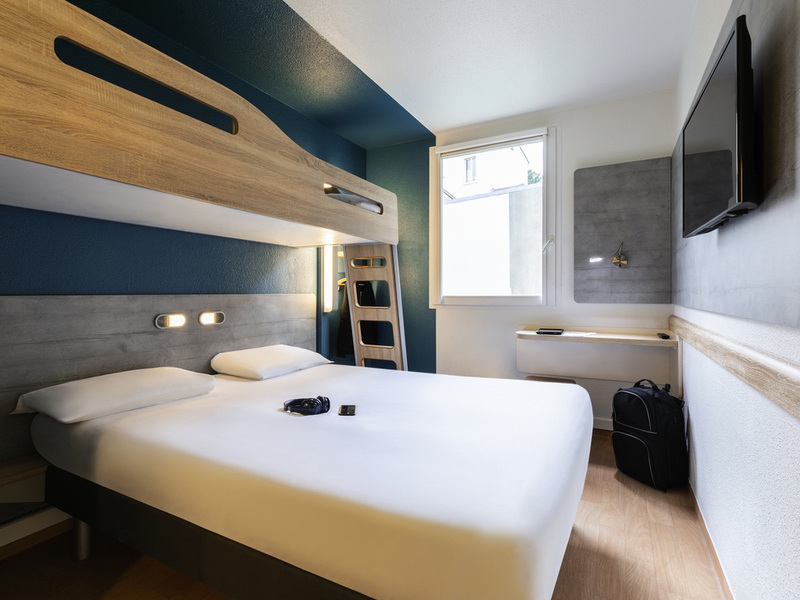 The 2-star ibis Budget Reims Thillois economy hotel has been completely renovated for your greater comfort. It has 80 modern and pleasant rooms designed for 1, 2 or 3 people. The rooms are air-conditioned and are equipped with a shower, toilet, TV and fre e WIFI, all for a great price. You can also enjoy a delicious breakfast for a price that won't break the bank! A free, secure, outdoor car park is also available. The ibis Budget Reims Thillois is close to the Champagne Ardenne and Reims Centre TGV train stations and the A4 and A26 highways. Discover the famous Champagne houses, the famous Notre Dame cathedral and champagne vineyards. TWIN - room with twin beds for up to 2 people. As above. Also, arrived late but welcomed by very smiley and helpful receptionist called Annaelle. Thank you. We stayed one night as a stop over on a long trip. The hotel is basic (has not been refurbished like some of the others) but that suited us and is located just off the motorway. Unlike other ibis budgets this is situated amongst out of town restaurants and a cinema. Great for food and entertainment. The lady on reception was fantastic and friendly. She even remembered our last visit 4 years ago. We did arrive late at night and had difficulty in using the phone number given on the closed entrance gate using UK mobile phone. no combination of codes would work. It was only in returning to the lobby and banging more loudly on the door that we managed to gain entry. Excellent value but price advertised was higher when I came to book before adding the French tax. Room was very clean and tidy. Warm and friendly welcome. Room was clean, We were expecting basic but not this basic, would describe this more as a hostel. Overpriced for the standard of accommodation. The best Ibis Budget hotel yet. We were able to book a room suitable for a disabled person directly on the Ibis website, which is a very welcome new feature. The room was excellent for a budget hotel and the reception we received was very friendly and helpful. Disappointed that there were no tea and coffee making facilities in the room. The staff were very friendly and efficient. Friendly, efficient check in, good location, lots of places to eat close by, easy access from motorway. Rooms clean. Friendly and helpful night manager; clean rooms; great breakfast for money. Very bad air coming up from drains on two stays at this hotel. We stay here regularly and always receive a warm welcome. However on the last two stays here, we have experienced a problem with the drainage system which allows bad air from the sewers into the rooms. In spite of a change of room, there was still a hint of bad air. Good location, helpful staff and clean comfortable rooms. Good location, secure parking, pleasant staff and clean, comfortable room. great stopover stay on our way down to south france. Easy to find, smooth checkin & out, family friendly room. We were greeted warmly as returning customers. The room was clean and functional. we regularly use this hotel to stop over - need I say more? We regularly use this hotel to stop over - need I say more? We wouldn't return time and time again, if we were not happy! Friendly staff, clean bedrooms / bathrooms, plenty to eat at delicious breakfast.